Stoneware, relief, 0.4L, pewter lid, side panels vary. 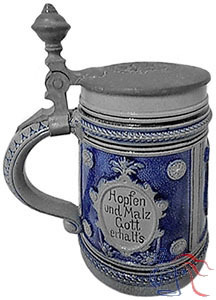 This stein is somewhat unusual in that that was specifically intended for special orders. All versions displayed the same central image, but with varying side panels and pewter fittings suited to the customer’s requirements.